When it comes to vehicle safety – no form of ground transportation is safer than a school bus. Not only because school buses are built from the ground up with student safety at the forefront, but because they’re operated by some of the most qualified drivers on the road! 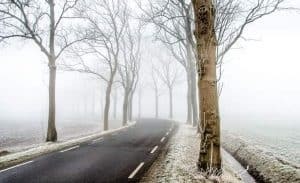 Dealing with our cold weather while on the road means preparing and beating old man winter — and that includes taking all the necessary steps to make your winter driving experience as safe as possible. Here are five simple tips for a safe season this year, whether you’re planning a fun sightseeing trip or sticking with your usual commute. At Switzer-CARTY, the ultimate priority is passenger safety. Whether we’re driving school district children to school or operating bus rentals here in the GTA & Southern Ontario – we focus on your group’s safety first! Don’t skimp on preventative maintenance. Follow your vehicle manufacturer’s recommendations for a service schedule. The last thing you want is to find yourself stranded at the side of the road due to a break down on a cold winter evening — proper maintenance will go a long way towards preventing this from happening. At the start of the season, your winter driving skills will be rusty. Drive more carefully than usual after the first few snowfalls until you’ve gotten used to how your vehicle handles on ice- and snow-covered roads. You’ll need to allow for longer braking distances, the need for slower turns, and even reduced driving speeds depending on current conditions. Use the right tires for the season. All season tires are okay, but if you can afford it, treat yourself to winter tires. It’s hard for some to believe, but modern winter tires make a massive difference in how quickly you’re able to bring your vehicle to a stop, reducing skids, and improving the precision with which you can steer your vehicle in the right direction. Some people say it’s downright liberating to experience the superior control of the vehicle they feel when driving on winter tires. Especially if you’ll be driving in rural areas where it may be hard to get help quickly in the event of a breakdown, keep blankets, flashlights, and emergency supplies in the trunk. It’s also a good idea to have any tools you’d need to change a flat tire on the go. Aside from ensuring you won’t run out of gas on a cold, stormy night, this also helps to ensure your gas line won’t freeze up. Safe Driving from the Professionals! Do what professional drivers do and take a few simple precautions prior to setting out on the road. That will ensure this winter driving season goes well with a minimum of mishaps. With just a little planning you’ll never be left out in the cold!